Embodying the WRX series product concept "Pure Power in Your Control" at the highest level, the WRX STI is the flagship model of the series. Every component of the vehicle, including body and chassis, has been refined and coordinated to achieve the ultimate in Subaru all-wheel drive (AWD) sports performance, enabling drivers to control the vehicle's ample power*1 at will. Standard equipment includes Subaru's motorsport-bred turbocharged 2.0-liter Boxer engine and multimode Driver's Control Center Differential (DCCD) system. *1: 227 kW (308 PS) at 6,400 rpm and 422 N・m (43.0 kgf・m) at 4,400 rpm. An exclusive inverted-strut front suspension system has further refined steering response. Steering has been made more precise with a more rigid steering system. 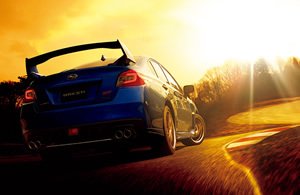 The new WRX STI is equipped with a 2.0-liter Horizontally-Opposed turbo engine, serving as a symbol of Subaru's high performance and reliability, as perfected in motorsport. Through precise tuning, the engine produces an impressive 227 kW (308 PS) at 6,400 rpm and 422N・m (43.0 kgf・m) of torque at 4,400 rpm. Compared to the previous 6MT, the new WRX STI transmission was given better tactile feedback with gears that lock solidly in place for a sportier shift feel. The WRX STI equipment package continues to come with the multi-mode DCCD system, a carryover from the previous model. This system allows the driver to freely select center differential control characteristics according to road conditions and driver's preferences. Based on the Symmetrical AWD, a lighter, more rigid body and an enhanced chassis incorporating the Vehicle Dynamics Control (VDC) system achieve superior hazard avoidance, allowing drivers to enjoy the ride with peace of mind under any conditions. 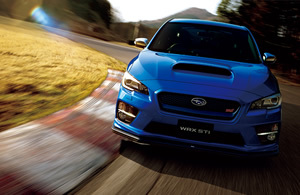 The WRX STI employs more high tensile steel plating with strengthened joints with various structures. While helping to reduce weight, these changes also make for a stronger body with world-class safety performance in collisions from the front, rear or sides. The unrivalled WRX STI character from successive generations has been honed yet again by further improving its practicality as a performance four-door sedan. LED lighting is employed for the headlights (low beams and clearance lamps)*2, tail and brake lights and high-mounted brake light in an effort to improve fuel efficiency by saving power. Decorative carbon trim panels and metal trim accents have been arranged around the interior, centered on the controlling elements. This gives the interior a quality feel and harkens back to the WRX racing image. The red accents on seats, shift lever and center of instrument panel are exclusive features for the WRX STI.